Junior Film student Heriberto Zavala works in Peer Connections, a support service that provides peer mentoring, peer tutoring and supplemental instruction. 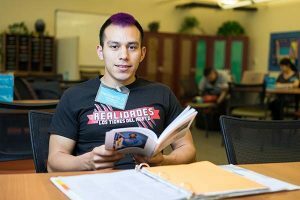 Peer Connections, a program offering holistic academic support to students, is playing an integral role in efforts to improve the rate of student success at San Jose State University. Deanna Peck, Peer Connections director, is hopeful about expanding and enhancing their services in coming years. Having been hired to improve and expand the program five years ago, Peck has seen the number of tutors, mentors and supplemental instruction leaders increase from 25 two years ago to 60 this spring. That could double to 120 by fall with more funding. The services are aimed at helping students not only survive but also thrive throughout their college experience, especially in difficult classes with high-failure rates or first-year classes through which students are learning what it means to be a Spartan. 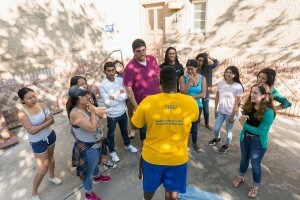 University officials expect Peer Connections will provide significant support as part of the Clearing Bottlenecks initiative — one of SJSU’s Four Pillars of Student Success adopted by the university to improve the student experience while also keeping students on track to graduate in four years for first-time freshmen or two years for transfer students. Currently, the average time is 5.2 years for first-time freshmen. Peck said tutors generally work with students on class content, while mentors focus on assisting students with study strategies, time and stress management issues. Supplemental instructional leaders are assigned to facilitate study sessions for classes with high failure rates. Tutors and mentors who work in classrooms or the spacious study area inside the Student Services Center earn more than minimum wage and average 9 to 12 hours a week on the job. Lauren Cordova, a peer mentor, behavior science major and one of this year’s outstanding graduating senior recipients, said she works with many student athletes grappling with time and stress management issues. Michael Fashola, a chemistry major and peer tutor, said he fields many questions from students in chemistry classes about specific problems from lectures or homework. Sonnan Naeem, a peer tutor and anthropology major, said he finds satisfaction guiding fellow students as they work through some of the same problems he had earlier in his academic career. Having already dropped a physics class at Ohlone College in Fremont, student Haider Syed said he knew when he transferred to SJSU in fall 2014 he would need help from tutors for such classes as physics and calculus. The former engineering major found Peer Connections online his first semester, but also saw presentations about it in classes. Though Syed switched his major to business, he still uses tutors two hours a week. “The tutors are there to help me,” he said. “I make a note of a problem I have during a class and discuss it with them. I bring my textbooks if I have a homework problem I don’t understand. I can pass these classes on my own, but I feel tutors have helped me get higher grades. Ingrid Salazar, a junior majoring in environmental studies who transferred to SJSU last fall, brings homework to the Student Services Center an hour before an appointment with a tutor. She learned about Peer Connections from a classmate. Several weeks into the fall semester Salazar said she wasn’t faring well in pre-calculus. Vowing not to fail a class, she started working with tutor Jacky Cheng, a chemical engineering student. Salazar noted she felt overwhelmed at times in her class. She’s working with him again this semester after struggling with a chemistry class. Salazar said the help she has received from tutors will assist her in graduating on time. She hopes to join the Peace Corps. Another student who frequently visits Peer Connections to study and improve his skills and gain confidence is Martin Tran, a junior majoring in Creative Arts. He heard about the program on a campus tour. Like Syed and Salazar, he has worked with tutors, but also mentors. “This is a great place for me because I’m able to get help on assignments,” Tran said, adding he receives assistance on study skills to prepare to take upper division courses as a disabled student. University officials allocated $2.8 million for clearing bottlenecks during the 2016-17 and 2017-18 academic years – classes that have long wait lists that are a prerequisite to make progress toward degree as well as courses with high-failure rates. It may already be bearing fruit. The number of units taken by both the overall student body and among new students has seen a slight uptick, according to Dr. Stacy Gleixner, SJSU’s interim associate vice president for Studen t and Faculty Success. “We’re focused on providing greater access to classes and improving student performance in high-failure rate classes,” Gleixner said. According to university statistics, the average unit load (AUL) for all SJSU undergrads last fall was 12.7 units, compared to 12.4 for the fall 2015 semester. Students who attempted to take a full semester load of 15 units increased significantly last fall compared to a year before: from 18 percent to 33 percent among freshman, 28 percent to 36 percent among sophomores, 28 percent to 31 percent among juniors and 29 percent to 31 percent among seniors. Among new transfer students at SJSU, it increased from 14 percent to 20 percent. A 2015 study by the Public Policy Institute of California spurred action on this issue not only by SJSU and California State University leaders but by members of the state legislature. It predicted a shortage of a million workers with bachelor’s degrees by 2025, and another deficit of 500,000 workers with at least some college course work. High-failure rate classes exist in every college. Sometimes high failure rates in classes can be an issue of technology, while at other times, students struggle because they lack the proper background and prerequisites to succeed in a difficult course, Gleixner said. Her team is working to increase awareness of the tutoring, mentoring and supplemental instruction services offered by Peer Connections while seeking out additional funding to expand services. Chemistry Professor Resa Kelly, second from the left, presented research on using visual animations in teaching chemistry this summer. 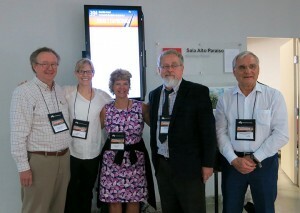 Here she is pictured with colleagues at a meeting in Brazil. A group of San Jose State University professors who work in the College of Science as part of the Science Education Program is offering their support to faculty who are interested in incorporating high-impact practices into their curriculum to support student success. Ellen Metzger, the director of the Science Ed Program and a professor of geology, attended a summer workshop on high-impact practices at the University of California, Los Angeles. “It helped me understand the practices better and I am really grateful to be part of a team that is developing sustainable and interdisciplinary tools,” she said. The Science Education Program also includes Resa Kelly, a chemistry professor, Cassandra Paul, a physics and astronomy professor, and Elly Walsh, a meteorology and climate science professor. The four are versed in curricular design, transformation and evaluation along with using technology to design and study learning. As part of SJSU’s Four Pillars of Student Success, high-impact practices are recommended to increase student engagement and help to clear bottlenecks in key courses. Kelly began her teaching career at the high school level and is particularly interested in helping students make the transition from high school to college-level chemistry. Chemistry is a prerequisite for some majors that often causes a bottleneck due to a higher rate of failure or withdrawals than the average across other courses. Using a grant from the National Science Foundation, Kelly’s research is aimed at developing visualizations to boost deeper learning. She has worked with SJSU animation artists and computer science students to create short videos about the atomic level details of chemical reactions where the outcomes conflict. Walsh is currently involved in research on understanding and supporting student engagement in socially controversial scientific issues, such as climate change causes and impacts. Paul is a member of the Physics Education Research group. She has experience in investigating the interactions between students and instructors in interactive classrooms and helped develop the Real-time Instructor Observing Tool (RIOT). Metzger said the Science Ed team is particularly hopeful that plans for an interdisciplinary science building will allow them more opportunities to collaborate with colleagues from other colleges. She also noted that project-based learning offers an opportunity for students to feel connected to their community. “The key to equity is engaging students of all types in their learning,” she said. Stacy Gleixner, interim AVP for Student Academic Success, and Amy Strage, AVP for Faculty Development and director of the Center for Faculty Development, also attended the summer workshop on high-impact practices. They are developing easy to implement “Faculty Matter” tips that are sent to all faculty weekly by email and archived on the Academic Spotlight blog.